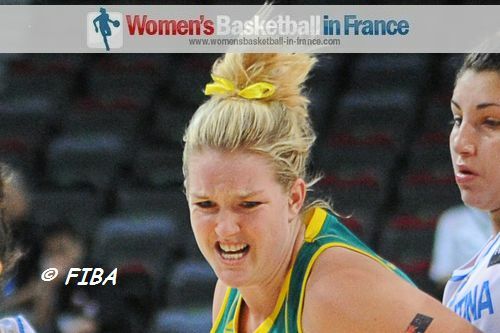 Australia were the biggest winners on day 5 of the 2013 FIBA U19 World Championship for Women by beating Brazil and booking their place in the quarter-finals. Elsewhere the USA failed for the first time in this competition to reach the 100-point mark despite winning by 34 points. France and Spain joined the USA in the unbeaten club while Argentina registered their first victory of the tournament. The biggest losers on the second day of the Eighth Final Round were Serbia whose defeat to Japan eliminated them from the title race. Casey Samuels (in picture) hit 3 three-pointers for Australia during the second quarter against Brazil turning a (11-16) deficit into a (30-22) advantage by the break. Australia stayed in front the rest of the way and handed Brazil their first defeat (69-51). Samuels finished with 21 points in leading all scoring as the Gems punched their quarter-final ticket. Japan put an end to Serbia's challenge for a World Championship title (87-62) with 22 points coming from Miyuki Kawamura. Her team-mate Mirai Tamura dished out 10 assists while scoring 14 points. Spain maintained their unbeaten record by defeating Russia (80-72) in a scrappy match. The Russians were better for the first three quarters but let the game slip away during the final ten minutes. The loss for Russia is of no consequence because to qualify for the U19 FIBA World Championship for Women quarter-finals they must beat Japan in the final Group E game. The USA beat Canada (88-54) with 17 points, 7 assists and 5 rebounds coming from Breanna Stewart. Despite failing to reach 100 points for the first time, the Americans were not really troubled by their country neighbours. 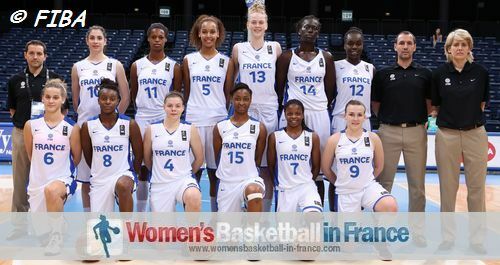 France were excellent at the defensive end by allowing China just 43 points (17-from-54). They also won the rebound battle 42-30 and cruised to victory (62-43). The Netherlands were able to get past Lithuania (72-65) by hitting 4 three-pointers during the last four minutes of the game. By winning this game, the Netherlands join Canada, China and Lithuania in the battle for the last two quarter-final places. Argentina opened their winning account with a comfortable victory against Mali (70-51). Korea showed no mercy to Senegal as they cruised to a comfortable victory (97-64). This group competition comes to an end after the final group game on day 6.